Capable of throwing any type of pitch (fastballs,curves,sliders) from either left or right hande delivery, it's maximum speed exceeds 80 miles per hour. 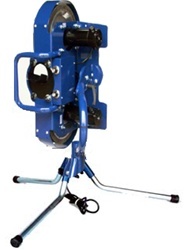 BATA-2 Softball Pitching Machine is the only machine with Soft-Tread Pitching Wheels, designed specifically for throwing real leather baseballs. The BATA-2 also has optional transport wheels, so you don't have to roll it on the pitching wheels to transport it as you do with the JUGS. Speed 25-90mph from 46 ft.